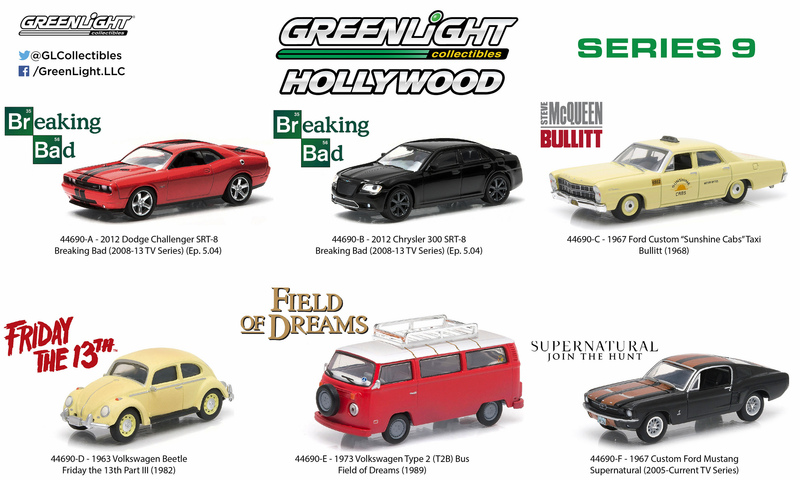 This week we got in Greenlight Cars Collectibles Hollywood Series 9 1:64 Scale Diecast. This series of cars includes cars from the Hollywood Collections. It includes two cards from the AMC Series Breaking Bad, a 2012 Chrysler 300C SRT-8 and a 2012 Dodger Challenger SRT-8. A taxi from the 1968 Movie Bulitt featuring Steve McQueen, the 1967 Ford Custom "Sunshine Cabs". The bus driven in the 1989 Movie Field of Dreams, the 1973 Volkswagen Type 2 Bus. From the movie Jason Lives: Friday The 13th Part 6! the 1963 Volkswagen Beetle. Also from Greenlight Collectibles, the 1967 Chevrolet Impala Sports Sedan from the CW hit series Supernatual.